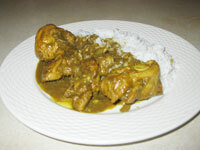 Curry chicken is very popular and there are many variations. Try this recipe and you will never have to try another. Add all ingredients except oil and chicken , into a bowl add 1 cup of water mix throughly. Add oil in a pan or pot (non stick is very good) and heat add mix ingredients and stir for a few minutes (3 or 4 ) add1 cup water contuinue stirring , adding water as necessary and contuinue stirring for 6-10 minutes. Add 1 1/2 cups of water, cover and cook on slow heat for 8-10 minutes. Add small amounts of water if needed . Taste the sauce for desirable salt.